40 Commando RM is a battalion-sized formation of the British Royal Marines and subordinate unit within 3 Commando Brigade, the principal Commando formation, under the Operational Command of Commander in Chief Fleet. Tasked as a Commando light infantry unit, 40 Commando (pronounced "Forty Commando") is capable of a wide range of operational tasks. Based at Norton Manor Camp, Norton Fitzwarren their barracks is in Taunton, Somerset. Personnel regularly deploy outside the United Kingdom on operations or training. Whilst 3 Commando Brigade RM are the principal cold weather warfare formation, personnel are capable of operating in a variety of theatres including tropical jungle, desert or mountainous terrain. The Commando is a regular participant in the annual Brigade cold weather warfare exercise in Norway. The unit's first "winter" was 1991, until which the unit was nicknamed the "Sunshine Commando". All personnel will have completed the Commando course at the Commando Training Centre (CTCRM) at Lympstone in Devon, entitling them to wear the green beret, with attached personnel having completed the All Arms Commando Course. Early Commando units were all from the British Army but by February 1942, the Royal Marines were asked to organise Commando units of their own, and 6,000 men volunteered. The first Royal Marines commando unit was formed at Deal in Kent on 14 February 1942 and designated 'The Royal Marine Commando'. Before long it was re-designated RM 'A' Commando. Col J Picton Phillips was the Commanding Officer. The Commando's baptism of fire was at Dieppe on 19 August 1942. In support of the main Canadian assault force, Nos. 3 and 4 (Army) Commandos were to destroy the enemy coastal batteries covering the main landing beaches, whilst No. 40 had selected tasks in the port area and was to be responsible for reinforcements as required. In the pre-dawn run-in the landing craft of No. 3 were fired upon and scattered with the result that only two small parties managed to land, one was overwhelmed, but the other successfully engaged the Berneval battery for some hours before withdrawing. On the other flank at Varengeville No. 4, under the command of Lord Lovat, carried out what was officially hailed as a 'classic operation of war' and completely destroyed the Hess Battery, successfully withdrawing and re-embarking with prisoners. Unfortunately, No. 40, when committed to their landing, under well-nigh impossible conditions, suffered severe casualties. Of the 370 officers and men, 76 were lost on the beaches. Among those killed was the Commanding officer (CO), while the second-in-command, Robert Houghton was captured. On return RM 'A' Commando was again re-designated; this time as 40 (RM) Commando. Further training and replenishment was carried out. Once back to full strength it was sent to Sicily in July 1943 and a little later in September saw action at Pizzio. Later that year the Commando was in action in Termoli in October, and in 1944 was embroiled at Anzio. Later service in Yugoslavia and Albania followed by policing duties on Corfu wound up 40's wartime activities. Following the Second World War, 2 Commando (Nos. 2, 9, 40(RM) and 43(RM)) disbanded leaving 3 Commando Brigade (42(RM), 44(RM) and 45(RM)). To recognise 2 Commando Brigade one of the Commandos was renamed, No44(RM) becoming No40(RM). The Commando was deeply involved in 1947–1948 Civil War in Palestine acting as the rearguard in the Protectorate, leaving in 1948. They subsequently undertook security duties in Cyprus, Hong Kong and Egypt before moving to Singapore in 1961. It was involved in operations during the confrontation with Indonesia (Borneo) throughout the following decade. In 1971 the Commando left Singapore and re-established itself in Seaton Barracks, Crownhill, Plymouth. Over the next decade the Commando found itself deployed to Northern Ireland four times and also undertook an unexpected two-month tour in Cyprus after the 1974 invasion by the Turkish Army. In 1982, following the Argentine invasion of the Falkland Islands, the Commando deployed on Operation Corporate. On 21 May the Commando were among the first troops ashore and secured the beachhead at San Carlos. The Unit was subsequently split having two companies attached to the Welsh Guards, preparing to attack Port Stanley, when the Argentine surrender came. On their return from the Falklands, the Commando spent the rest of the decade involved in a variety of tasks including two Northern Ireland tours to South Armagh, a six-month Peace-Keeping tour in Cyprus and a six-month operational tour in Belize. During the tour in Cyprus, the Commando was awarded the Wilkinson Sword of Peace for the third time. Also during this period, in 1983, the Commando relocated to Norton Manor Camp near Taunton. In 1991 the Unit undertook its first Norway deployment but found itself undergoing a dramatic climatic change when, due to the Gulf War, it deployed to Northern Iraq to ensure the security of Kurdish refugees. Northern Ireland tours, Norway winter deployments and a major Asia-Pacific Exercise kept the Commando busy through the following years. In November 1993 the unit deployed to West Belfast in support of the Royal Ulster Constabulary (RUC), returning in May 1994. In 1998 a substantial part of the Commando deployed to the Congo to ensure the safe evacuation of UK nationals from Kinshasa City. 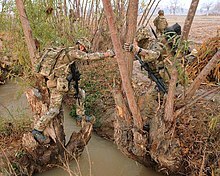 Royal Marines from 40 Commando cross an irrigation ditch in Helmand Province, Afghanistan. Royal Marines from the 40th Commando unit load onto a Landing Craft Utility (LCU) following intensive training in the Kuwaiti Desert. The new millennium saw the Commando deploy to Northern Ireland and on their return they were the first Commando to reorganise under a new structural concept called Commando 21. The Unit deployed in its entirety in January 2003, initially part of the Naval Task Group (NTG) 03 in HMS Ocean, HMS Ark Royal and Royal Fleet Auxiliary ships RFA Sir Galahad and RFA Sir Tristram. The group sailed through the Mediterranean Sea, after a brief stop at Cyprus, continuing through the Suez Canal bound for the Persian Gulf. The United Nations were engaged in diplomatic efforts to avoid the need for military intervention in Iraq, as the Unit was busy rehearsing in the United Arab Emirates and Kuwait for possible operations against Iraq. In March 2003 a coalition force, under the overall command of the United States, entered Iraq. During Operation TELIC 1, the liberation of Iraq, on the night of 20 March 2003, 40 Commando RM, under the command of Lt Col G K Messenger DSO OBE, mounted an amphibious helicopter assault to seize key Iraqi oil infrastructure on the Al-Faw Peninsula. As the first conventional troops on the ground, the strategic significance of the operation was immense and, as the Divisional Main Effort, the assault was supported by a vast array of coalition firepower. The Commando Group's role in the success of the coalition operation in Iraq was pivotal and profound. In a two-week period of intense operations, it secured key oil infrastructure, cleared a large expanse of enemy held terrain, and defeated a major enemy stronghold on the periphery of Basra, killing over 150 Iraqi soldiers and taking 440 prisoners. In 2004 the Unit returned to Iraq as part of a multi-national division peace-support operation. The commandos returned in April 2008 from a tour in the Helmand Province of Afghanistan as part of Operation Herrick. During the tour L-Cpl Matthew Croucher was awarded the George Cross for his action of jumping on a live grenade during a patrol. 40 Cdo returned to Afghanistan in 2010 for Op Herrick 12. They were the last British troops to leave Sangin, described as the "deadliest place in Afghanistan", after command was handed over to the US Armed Forces. A Company deployed with the UK Response Force Task Group in April 2011. Additional follow up forces were on board RFA Cardigan Bay. They then completed Exercise Red Alligator in October 2013: this trained their skills for the role of the Lead Commando Group. 40 Commando are CBRN defense experts, expecting to be the lead unit in the event of a CBRN incident. In 2018 they participated in the annual chemical warfare exercise, Exercise TOXIC DAGGER, on Salisbury Plain involving over 300 military personnel, along with the RAF Regiment, the Royal Marines Band Service for casualty treatment and utilising Defence CBRN Centre expertise. A Chinook flies in low over the heads of Royal Marines from Alpha Company, 40 Commando Royal Marines during Op DAAS 7B, Nahr-e-Saraj district, Afghanistan. The following Battle honours were awarded to the British Commandos during the Second World War. Portrait of a Royal Marine of Bravo Company 40 Commando Royal Marines. ^ "Major-General 'Titch' Houghton". The Telegraph. London. 19 January 2011. Retrieved 2 February 2016. ^ "Operation Mercerised". Commando Veterans Archive. Retrieved 17 April 2016. ^ "Royal Marines Commando and Special Boat Service". Commando Veterans Association. Retrieved 17 April 2016. ^ a b c d e f g h i j "40 Commando Royal Marines History". 40 Commando Association. Retrieved 17 April 2016. ^ "No. 58774". The London Gazette (Supplement). 24 July 2008. pp. 11163–11164. ^ "Royal Marines speak of 'horrible' reality of life on patrol in Afghanistan". The Guardian. 17 November 2010. ^ "RFA Cardigan Bay". Royal Fleet Auxiliary Historical Association. Retrieved 17 April 2016. ^ "Royal Marines deploy on Black Alligator". Royal Navy. 15 October 2013. Retrieved 4 April 2016. ^ "Toxic storm for Royal Marines in major chemical exercise". Royal Navy. 6 March 2018. Retrieved 7 March 2019. ^ "Exercise Toxic Dagger: training the UK military to mitigate CBRN threats". Army Technology. Verdict Media. 3 May 2018. Retrieved 7 March 2019. ^ "Exercise TOXIC DAGGER - the sharp end of chemical warfare". Defence Science and Technology Laboratory. gov.uk. 20 February 2018. Retrieved 7 March 2019. ^ a b c d "Royal Marines speak of 'horrible' reality of life on patrol in Afghanistan". The Guardian. Retrieved 22 August 2016. Beadle, Jeffery, Maj (1992). The Light Blue Lanyard: 50 years with 40 Commando Royal Marines. Square One Publications. ISBN 1872017525. Haskew, Michael E (2007). Encyclopaedia of Elite Forces in the Second World War. Pen and Sword. ISBN 978-1-84415-577-4. Moreman, Timothy (2006). British Commandos 1940–46. Osprey Publishing. ISBN 1-84176-986-X. Neillands, Robin Neillands (2006). The Dieppe Raid: The Story of the Disastrous 1942 Expedition. Indiana University Press. ISBN 978-0253347817. Wikimedia Commons has media related to 40 Commando Royal Marines.